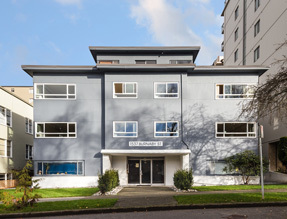 A rental housing building in downtown Vancouver’s West End neighbourhood recently listed for sale is a tad peculiar — not because of its asking price, but because of its vacancy. HQ Commercial’s listing for Lansdowne House at 1537 Burnaby Street — located on a mid-block site just south of Davie Street between Nicola Street and Cardero Street — states 17 of the 24 suites in the building are vacant, despite the West End being known for having Vancouver’s lowest rental vacancy rates. The 1956-built property is a three-storey, wood-frame building, and all but two of the suites are one-bedroom units. The lot size is about 8,600 sq. ft. The asking price is $10.8 million, slightly higher than the latest assessed value by BC Assessment of $9.55 million. The landlord recently spent $115,000 on upgrades, including exterior paint, new roof, new windows, and landscaping. As well, some demolition work has been performed on the 17 vacated suites. The property’s last transaction occurred early this year, when an unnamed buyer acquired it for $8.75 million.